The original is good in itself, but the remix has my attention, which I'll write about. It feels like the frustration, helplessness, and anger just keep getting bigger and bigger inside you while you listen to it. A true reflection of the title. The original should be called When Things Go Right, since it's really beautiful and full of bliss. But the remix lets you hear, feel and imagine what happens When Things Go Wrong. Full of emotions, it's dark, fast and aggressive, but still beautiful in its own way. It's the one that would make my emotions so unpredictable. If I ever have the luck of hearing it live, I think I'll want to jump harder and harder, beyond my physical capabilities. It's hard to explain what impact on me this one has. Airwave always said that the original is the simplest piece of music he's ever made. But the remix is so complex! Even though there aren't many elements. This one is on top of my favourites list, probably. I have never felt such a thing while listening to it. While 'Arisen' by Arksun put me in a heavenly place while I listened to it, this one did the opposite. Made me feel like a human. This review may or may not make any sense, but the need to write this was enormous. 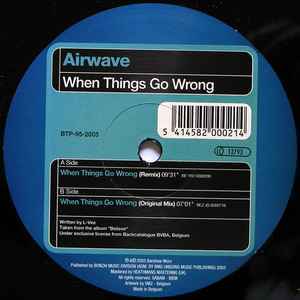 One of the best Airwave's releases.